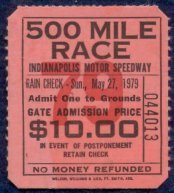 The 1976 ticket continues with the previous years winner and winning car depicted. It is the same **dimensions (5 1/8" x 2 1/2") as the 1975 stub. General admission tickets are still the same basic size at 2" x a little over 2 1/4". 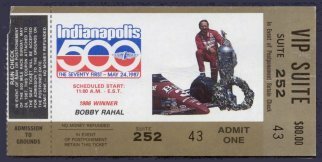 Tony Hulman's name appears on grandstand tickets for 1976 through 1978 and Joe Cloutier appears on 1979 and 1980. No name appears on tickets after 1980. 1980 marks the last year until 2009 that "International Sweepstakes" appears on the ticket. The ticket maker remains Weldon, Williams & Lick. The winning driver/car is replaced with the event logo for 1981 and 1982. This is the first and only time this occurs since a winning driver/car has appeared on the ticket since 1948. 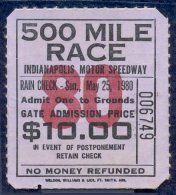 1947 tickets show Wilbur Shaw and 1949 grandstand tickets have 6th place finisher Jimmy Jackson. 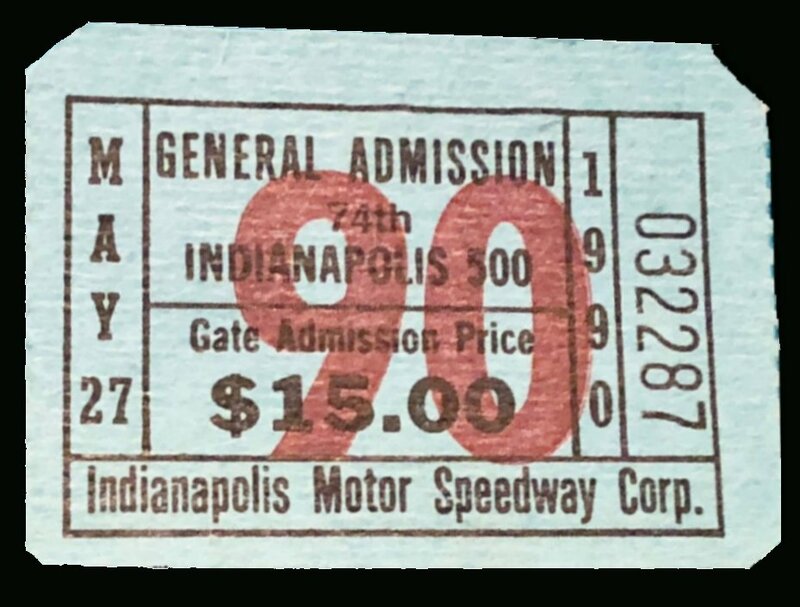 1949 Complimentary Employee tickets do have 1948 winner Mauri Rose on them and they are virtually identical to a 1948 grandstand ticket with the necessary changes for 1949 the only difference. The event logo now appears on all grandstand tickets through the present day. The small portion of the 1990 general admission ticket would’ve been attached to the top of the larger portion. 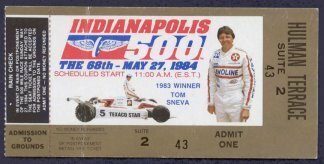 Note that the winning car is not on the 1992 ticket. Stubs from 1976 through the present become easier to obtain as the you go up through the years. If one had to chose which one or ones are tougher to find than another, the 1986 with rain check or unused and in very good condition or better will probably be tougher to find in the future. 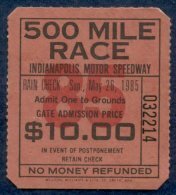 Tickets from the rain shortened races of 1975 and 1976 may be a bit tougher to find without rain damage. **All measurements are taken from the stub or used ticket.